The book of Hebrews is both a masterpiece and an enigma. Serious readers of the letter have always recognized the powerful effect of its carefully crafted discourse. They have also grappled with the implications of its theologically complex message. 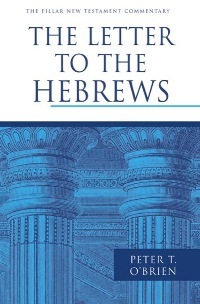 With his contribution to the Pillar New Testament Commentary series on The Letter to the Hebrews, Peter O’Brien takes his place in this long line of interpreters. Research fellow at Moore Theological College in Sydney, Australia, O’Brien is a well-established figure in the world of New Testament studies. As with most commentaries, O’Brien begins with a brief overview of the introductory issues (1-43). O’Brien holds that the author of Hebrews was a prominent leader among the churches and a competent exegete exceedingly familiar with the Old Testament Scriptures. The letter was most likely written in the mid first century to Jewish Christians located in Rome and in danger of returning to some form of Judaism. As a “word of exhortation,” Hebrews takes the form of a written sermon meant to be “read aloud again and again” (22). The many sermonic qualities of the text such as the use of the first person, the language of speaking and hearing, and the intimacy of the discourse confirm this observation. Accordingly, the structure of the book reflects this “complex interplay between exposition and exhortation” that runs throughout, with “major turning points” at 4:14-16 and 10:19-25 and central theological exposition in chapters 5:1-10:18 (34). Theologically, Hebrews stands within the mainstream of early Christian tradition but also contributes its own distinctive developments. These elements undergird the author’s purpose in writing which was to “hammer home repeatedly the importance of faithful endurance” to his readers so that they might “reach the eternal rest in the heavenly city” (35). O’Brien’s introductory survey is helpful and represents a snapshot of significant interpretive decisions he makes in his interpretation of the letter. One noticeable lacuna here is the omission of any type of theological survey, which turns out to be an intentional decision. O’Brien states that he will address the letter’s “major theological themes” in a forthcoming volume on the theology of Hebrews (xiv). Though understandable, his decision is nonetheless disappointing for a reader of this commentary. Though his comments on the text certainly account for theological elements, at least a brief survey would have provided a useful orientation to a document brimming with overt theological discourse. O’Brien’s comments on the text itself are both substantive and concise. This characteristic keeps the flow of the commentary moving at a steady pace. O’Brien makes good use of the footnotes in order to interact with contrary arguments on various interpretive decisions. On most of the issues he addresses, O’Brien utilizes the recent and most relevant scholarship available (e.g., journal articles, scholarly monographs, and unpublished dissertations). He also consistently draws on a wide-range of lexical and text-critical data to support his exegetical decisions. This robust interaction complements his dependably incisive textual commentary. One missed opportunity in this regard involves the use of “notes” at the end of exposition sections. After his comments on 1:1-2, O’Brien interacts with competing interpretations of the notion of “Christ as divine wisdom” under the heading of “Note 1”. However, this valuable tool is quite underused, occurring only once. This format could have been used in the text to outline the interpretive spectrum on a few pivotal issues (e.g., the warning passages). The value of a new commentary is not necessarily found in its synthesis of all previous interpretive work done on a book. These commentaries are readily available to most scholars and informed students. Rather, the contribution is often in how an author brings new developments in disciplines of New Testament scholarship to bear on the text under scrutiny. For example, O’Brien utilizes discourse analysis, which examines meaning above the sentence level. This tool aids in determining the relationship that each paragraph has to its surrounding material and also in discerning the structure of the book as a whole. O’Brien follows George H. Guthrie’s broad structure that traces the recurring shifts between the exposition and exhortation sections. At the appropriate places in the commentary, O’Brien works out the details of his structural decisions. This emphasis is especially appropriate for a letter that doubles as a sermon. O’Brien also makes use of verbal aspect theory, which holds that verb tenses convey the viewpoint of the speaker rather than merely the time of the action. This discussion is typically theoretical, so O’Brien’s application of its insights is helpful and sheds interpretive light on a number of texts. To give one example, the statement in Heb 1:4 that Jesus “inherited” a name greater than the angels is in the perfect tense form. O’Brien notes that the aspect of the perfect tense “powerfully draws attention to Jesus’ prominence and the superiority of his present position, rather than indicating when he received the name” (61). Thus, in relevant cases, O’Brien highlights the function of a verb’s aspect rather than only its temporal implications (see also 18, 99, 150, 421). O’Brien is also keen on new research concerning the New Testament’s use of the Old Testament. For instance, he integrates the recent strand of inquiry that detects a sustained allusion to the wilderness generation of Israel in key passages (e.g., 217-18). He also consistently examines the function of the Old Testament material. In this regard, he notes that the seven Old Testament quotations in 1:5-11 provide the exegetical support for the lofty Christological statements in the prologue (1:1-4). This type of analysis is also crucial in understanding a book that is rife with quotations, allusions, and echoes of Israel’s Scriptures. In sum, O’Brien has provided the church with a readable, rigorous analysis of an important New Testament document from a confessional standpoint. His volume certainly functions as a pillar in this commentary series and will represent a reliable account of the meaning and message of the book of Hebrews for years to come. In Southwestern Journal of Theology 55.2 (Spring 2013): 312-14.